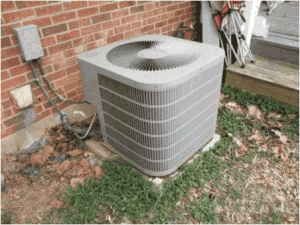 Yes, your air conditioner needs tune ups just like any other piece of mechanical equipment. Keeping your air conditioner tuned up will have the largest impact on lowering your electric bill and air conditioning costs. To locate any problems or deficiencies you need to have an HVAC inspection. Having your total system inspected will locate any problems you have with your compressor, condenser, fans, filters, ducts and blowers.Our inspections include checking the AC filters and HVAC ducts for leaks. Older ducts have been known to leak and when they are leaking, the air conditioning ducts are wasting your conditioned air by letting it escape from the system. Raising your thermostat a couple of degrees will also lower your air conditioning costs, but having a programmable thermostat is a better way to do this. 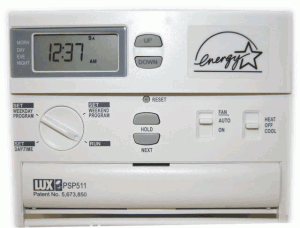 A programmable thermostat looks similar to the one to the right and there are many brands and options. With a programmable thermostat you can fine tune the temperature range throughout the day. The key is to set the thermostat for a comfortable range in the hotter part of the day and raise the thermostat setting during the cooler parts of the day. Programmable thermostats are real money savers. The south and west windows of your home face the sun at it’s hottest time of the day. Left uncovered these windows allow heat to be conducted into the rooms with the south and west facing windows. While energy efficient windows will block some of the heat from getting through, they do not block all of it. Lowering your blinds and closing the curtains on the south and west windows during the hot part of the day is an easy solution to help keep your energy costs lower. If your air conditioner filter hasn’t been changed in more than 3 months, change it now. The biggest energy waster is a dirty air conditioning filter. Not only does it take more electricity to push cleaned air through a dirty filter, the air pushed through the filter will be dirty and unhealthy as well. It only takes a few minutes to inspect and change your air conditioner filters and it will pay off with lower electric bills as well. Make sure your new air conditioning filter is the right size and of good quality. HVAC units and Air Conditioners in particular need maintenance and service on a yearly basis. Failing to have your air conditioner serviced is inviting a breakdown and most likely adding to your electric bill. Don’t get caught in the hottest part of summer needing service. Circle B Mechanical services all makes and models of home, commercial and industrial heating and air systems. We also provide service maintenance agreements to keep your system clean and tuned up for every season of the year. To stay cool and comfortable this summer call Circle B Mechanical at 918-367-6298 for all of your Tulsa air conditioner maintenance and service needs. This entry was posted in Air Conditioning, thermostat settings and tagged Air conditioning, Air conditioning service, filter changes, preventative maintenance agreements. Bookmark the permalink.